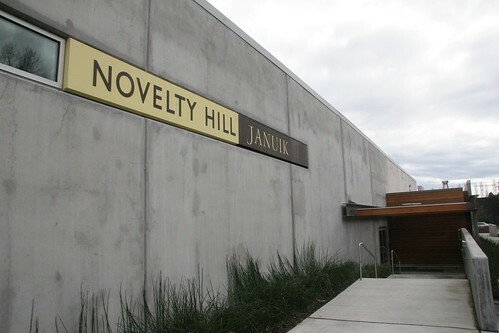 The Novelty Hill/Januik Winery is a big, concrete, wine-making monolith located just outside of Seattle in the shimmering suburb of Woodinville. Today I have left Mutineer base camp to visit Novelty Hill/Januik for a wine blending workshop/throwdown. For guidance and good company I have brought with me Mutineer Magazine Research Coordinator Julie Eckroth, and I can’t wait to get my blend on. I tasted through the Novelty Hill/Januik wine lineup a week ago and was very impressed. The thing that really stood out in the wines was the varietal character. All were very full of character and personality, with the Rousanne really being very awesome. Today is brick oven pizza day at Novelty Hill, and the tasting room is full of weekend wine warriors enjoying some pizza and wine on this warm winter afternoon. I’m about 45 seconds late and Novelty Hill/Januik winemaker Mike Januik has begun his sermon on the finer points of blending, his booming yet soft-spoken voice adding reverberating off the concrete walls in all directions. The gray of the concrete makes me feel like I’m in the estate winery on the Death Star. The very beautiful Nikki Dunbar of Novelty Hill/Januik greets me at the entrance and has me wait to stake a claim in the class until Januik finishes his talk, though I’m certain I’m still a distraction with a camera bag slung around my shoulder, a tripod under my arm, and a thirst for wine in my eyes. There are four women and only one gentleman at my blending table, which would typically be huge for morale, but these women are cougars and of another generation’s mentality. 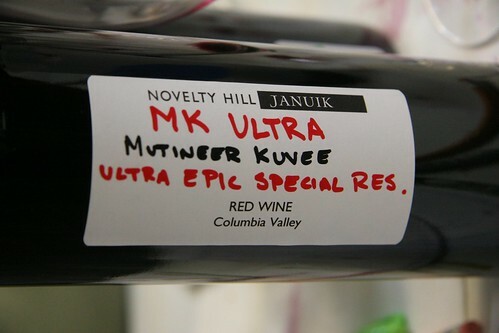 Better this way; I need all of my concentration to create a wine blend worthy of being called “MK Ultra: Mutineer Kuvee, Ultra Epic Special Reserve”. First things first, I taste through the individual wines. The Alder Ridge has more structure of the two Cabernets, the Stillwater Creek Malbec seems to be the most fruit forward and complex, and the Stillwater Creek Merlot is round and soft on the palate. Using a pipette siphon and graduated cylinder I begin to assemble these early standouts into a Malbec dominated blend at the following ratio: 50% Malbec, 25% Klipsun Cabernet Sauvignon, and 25% Stillwater Merlot…FAIL. The blend isn’t bad, it just isn’t great. Meanwhile, our table is stirring over the blending combination of one of my Research Coordinator, and she is quickly becoming a folk-hero in our little world. Her blend of 50% Stillwater Creek Merlot, 30% Alder Ridge Cab, and 20% Stillwater Creek Malbec is a damn fine blend, and with her permission I use it to make my “MK Ultra: Mutineer Kuvee, Ultra Epic Special Reserve”. Once you figure out your proportions, you mix an 800 ml batch which will be your final wine to be bottled. 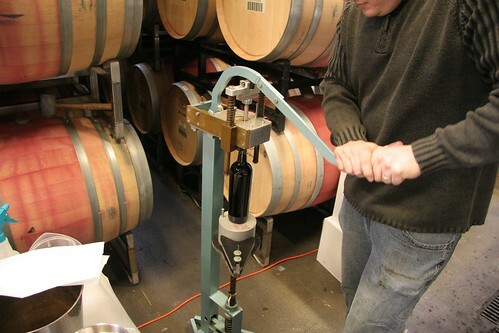 I mix my wine and head over to the bottling station, where it is funneled into a sleek, Bordeaux-style bottle to just the perfect level as to minimize residual oxygen between the top of the wine and the bottom of the cork. Next up is the corking machine, followed by a foil cap and a white label with sharpie markers to give our new creations the final touch. After checking out the cheese spread I track down Januik to play some journalistic hardball, asking him if there is anything in particular that participants in these blending classes learn, “They’ll say blending is harder than they thought with all the choices you have. There has to be a guiding principle, which is to make a wine of a certain style, regardless of the vintage.” Good answer Mr. Januik. I keep meaning to head out to Woodinville but I always put it off. I must go now! Is this winery a good one to visit? Sounds like a great time, I’ll have to check it out if I’m ever in that region!